As an author, the concept of being seen is both delightful and terrifying. There is comfort in anonymity, slipping into the background and letting the words on the page speak for us. But how do we get the sales to keep coming in, day after day, after the excitement of the launch has waned? And how do we attract new readers who aren’t in our current circle of influence? Branding yourself as an author requires you to step out from behind your book to fully engage your audience and develop relationships. This can be a daunting proposition, especially if you are an introvert. 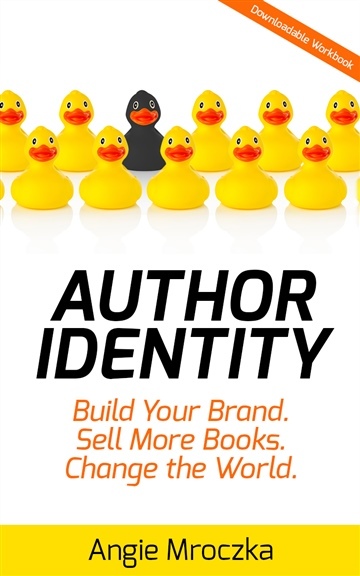 In this action-oriented guide, Angie Mroczka shares with you the process and opportunities available to authors who choose to direct and grow their brand. Through case studies and her own experience coaching writers to become better marketers, Mroczka will show you how branding allows you to set yourself apart from the crowd, positioning yourself as an authority and trendsetter. - Shocking truths behind some commonly held branding myths. - Proven strategies to help you discover and attract your Ideal Readers. - Practical tips for defining your brand through your books, website, marketing, and on social media. - An actionable workbook and bonus checklist to take you step-by-step through the entire process. Quit being a wallflower and finally be seen by your Ideal Readers. Angie Mroczka is a certifiable geek and publishing expert who helps self-published authors use technology to build sustainable writing careers. After starting her first business at age seventeen, she later abandoned her dream of becoming an entrepreneur to be a responsible adult. After trying to fit into the corporate mold for fifteen years, she finally liberated herself from the ‘cube farm’ and hasn’t looked back. Angie has worked with dozens of authors like Laura DeLuca, Kris Oster, and Kyrja to bring their titles into the world, publishing 93 books that have sold more than 75,000 copies in the last four years. With a background that includes a unique mixture of art, design, marketing, and business, she has the skills that help writers overcome their technical challenges, sell more books, and recover more of their precious time. When Angie isn’t trying new software or writing, she loves to create book covers. She is very passionate about making books beautiful, both inside and out. Angie currently lives in Houston, Texas with her husband and three-year-old son. Learn more about her on her blog, AuthorGeek, or connect with her on Facebook and Twitter.